I used to make a living as a Registered Investment Adviser and worked with Vanguard Group and other investment management firms. Now I provide generic standardized advice on investments when appropriate in the course of other accounting and financial planning services. My work now does not require a separate government registration as an investment adviser. Why isn’t the advice regulated? Because the advice is so simple and self-evident that it does not cross over into what the federal and state governments consider a regulated activity1. What’s the advice? Open an account at Vanguard and pick from among their most popular no-low ultra low cost broad market index funds. Then follow a few simple, well-researched and widely publicized investment management principles, and you’ll do better than most investors over the long term. What’s the evidence? There is plenty of academic evidence to support this approach that is not discussed here. But this latest report is a good starting point (or ending point for those who wish to take the short course). What about results? 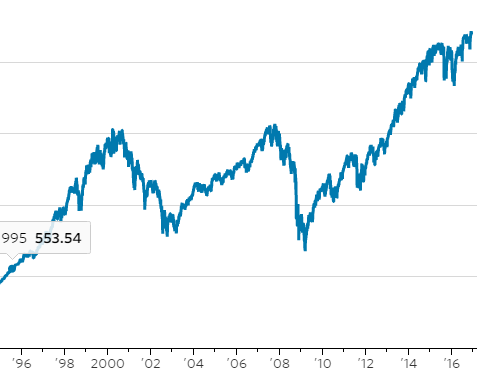 This article in Wall Street Journal today talks about how Warren Buffet bet on Vanguard Index Fund that outperformed – by a large margin – the hand-picked investments by professionals. While this story is anecdotal, the underlying principle is well-proven in portfolio science. Plainly stated: no load index funds are the best option for individual investors. Vanguard Group is at the top of the heap in this investment specialty. 1 Not all accountants agree with this position, apparently especially those without an investment career background. My own background includes years of work as a registered representative, a master’s degree with a specialization in portfolio management and adviser registrations with the Pennsylvania and New Jersey securities commission. I now feel comfortable talking and writing about investments on a generic basis without triggering a requirement for separate career registration.